Are you using Google Classroom this school year? I love combining favorite tools! Spark Video is a fantastic, web-based and mobile movie-making tool for students. If your students are using Google Classroom, they can easily share their Spark Video creations with classmates before showing off their work to the world! Spark Video is a powerful, easy-to-use video creation tool from Adobe. It’s totally free for schools who can access all of the premium features at no cost. I shared this announcement from Adobe Spark earlier this year which describes how to access the free features at your school. Spark Video works on the Chrome web-browser (and iOS devices too) making it perfect for Chromebook classrooms. In Google Classroom, you might use the About page for your class in a few different ways. It’s a great spot to add resources you want students to have easy access to all school year. In addition to posting a syllabus or course outline, you can include a Spark Video for students to watch. At the beginning of the school year, you might create an All About Me video to introduce yourself to your students. This video could be an exemplar for a student project where they create their own All About Me videos too. Each week of the school year you can feature a new student in the About section of your class by posting their All About Me video for their classmates to view. I share strategies for these type of videos in this blog post. Instead of an All About Me video, you might share Spark Videos you (or your students) have made that serve as a review of a topic. This could include a link to a publicly accessible published Spark Video or an MP4 upload to a movie file created with Spark Video. From math tutorials to overviews of social studies concepts, the possibilities are endless. To kick off a new unit of study, post a mystery video in Google Classroom. It can serve as a teaser for a new unit of study and include a discussion prompt. With Spark Video, users can search for icons and images right from inside the tool. So if you know your next unit of study is all about the tundra, you might create a Spark Video with a series of photographs and icons to spark student curiosity about the topic. Alternatively, you might post this mystery video in a discussion thread so students can post questions about the topic. This activity could also connect to a KWL (know, want to know, learned). You can provide a space for students to tell you what they already know and want to know about a new topic. For student creators in your classroom, Spark Video is perfect for capturing reflections. You might ask students to follow a set sequence for a Spark Video reflection. For example, they might (1) introduce a project they completed, (2) share two things that went well, (3) share two things they would do differently, (4) close with a takeaway or action steps to apply to their next project. Students can share their Spark Video Reflections by posting a link to their published video in Google Classroom. You might also ask students to incorporate these videos into a digital portfolio. This type of creation can capture their growth over the course of the school year. As you get ready to combine two favorite EdTech tools, I’ve put together a series of tips. Of course, if you have a strategy you’d like to share, leave a comment at the bottom of this post. Have students create an outline for a Spark Video in Google Docs and share with a peer for feedback before moving into creation mode. This way students can work through the drafting process collaboratively. You can also peek into a student’s document to provide relevant and actionable feedback. Create a folder full of pictures you and your student snapped during a shared experience like a field trip, assembly or science experiment. Share this collection of photos with your class. This strategy will give students more options for bringing in images to their next Spark Video creation. When introducing digital citizenship skills to students, ask them to write comments to post on a thread in Google Classroom. These comments could include a response to a video created by another student or small group of students. 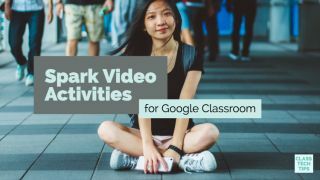 With this activity, students can practice their digital citizenship skills while creating a Video connected to content area goals. Ready to jump into this must-try combo? This link will take you to Adobe Spark’s homepagewhere you and your students can sign in and start creating Spark Videos. Adobe Spark’s education page has more information about setting up students who are under-13 and accessing all of the premium features for free! Check out these free graphic organizers to use with Spark Video.